Generosity is like an international language: everybody understands what it is, regardless of your educational or financial background. More and more ways of altruism are emerging every year. Within a few years Ukraine has shown an increased interest in charity organisations as well. For the majority of people helping others has become a part of everyday life. We talked with Lama Tenzin Sangpo about generosity in terms of buddhism, its relation to charity and which forms of voluntary help are the most important to accumulate merits for buddhists. Charity as an expression of generosity has become a part of life for a lot of people nowadays. It’s clear that you don’t need a lot of money, power nor free time if you want to change the world. Good, small actions help to increase the quality of life for others. The strange thing here is that it’s “contagious”. If some of your friends are doing charity work, you’ll likely get involved as well. Being generous together is easy. Other people’s generosity encourages us to do the same. So maybe generosity is a natural need? Lama Tenzin Sangpo: “People feel that problems happen due to some negative emotions, their consequences and the clinging to the “self”. Many of us have a deep understanding: if I only help myself and not those who are around me, I won’t become happier. People know and feel that their own happiness is dependant on the state of others around them. That’s why they’re trying to direct their care and actions outwards to improve the atmosphere. That’s why charity is so popular”. Generosity can undo our wrong perception of the world. Giving voluntarily – is a kind gesture, that works against one of the ten unkind actions known in buddhism, which accumulates negative karma. Acts of generosity also help to remove your prejudice, which is one of the reasons for being in samsara. Generosity is a good antidote against an egoistic mind that clings to “I”. With the help of generosity we gain merits that will lead to the understanding of the true nature of the mind. And the realisation will lead to liberation and enlightenment. Generosity also deepens our compassion. For example, we collect money for treatments or cures, because deep inside we don’t want people to be sick and hurt. We donate clothes to poor, because we know what it is to be cold. This way generosity is a base for loving kindness not only in you, but also in your family, city, country and the whole world. Motivation is something that can transform our daily routine into a buddhist practice. In the general sense, motivation usually includes a certain selfishness: we perform an action in order to get something, even when it is just to get some satisfaction. Contrarily, Bodhisattvas are ready to help all existing creatures, while at the same time having an absolute altruistic mindset. They are loving and know how to help. Bodhisattvas are even willing to give their lives, but for us, ordinary humans, this is very hard to understand. Nevertheless, human and Bodhisattva’s generosity is the same. When talking about the foundation of it – motivation, then here the important quality is – selflessness. When generosity leads you to feeling discomfort, by depriving yourself or feeling wrong about it, then you’re simply following a trend or fashion, and not your own inner, strong belief. True generosity is a state of mind, when we’re ready to give what other people need. This relates to our upbringing, when adults taught us to share toys or sweets with other children. But sometimes this could cause an outbreak of greed. Even after growing up we might think: if I give something, then I’ll have nothing. But generosity is not about giving out everything and becoming a beggar. It’s the willingness to give freely when appropriate, without regret or doubt. Not all help is useful. 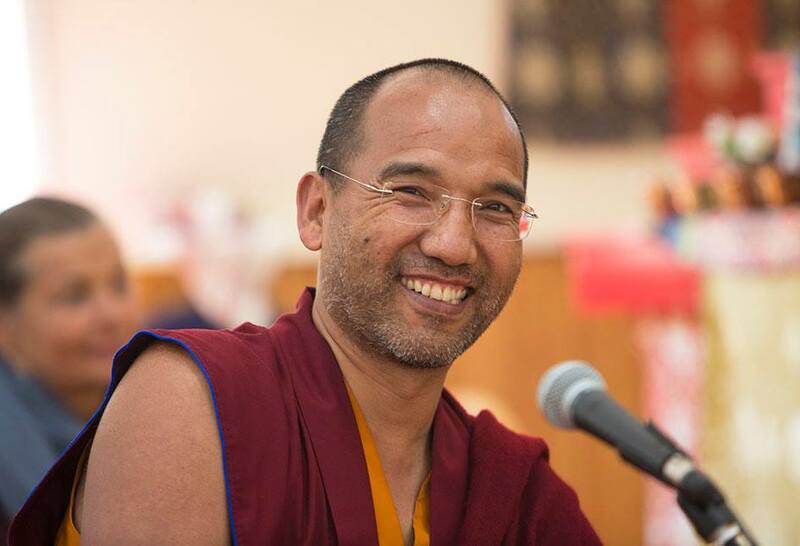 Lama Tenzin Sangpo: “According to buddhism, generosity can be directed towards two things. First – donate to a higher cause, for example, take refuge in Triple Gem. Second – give donations towards somebody equal or lower than us. These two lead to accumulating merits, but only if the objects are true. If we talk about giving to those who are in need, then our donations should help and not worsen the situation. There must be wisdom in your actions. You must know to whom and what you are giving. For instance, in Nepal and India you can see many children who beg. If we give them money, they bring it back to their parents. Instead of going to school, they come back to the streets and beg for more. Is our donation useful? Do we participate in exploiting child’s labour? We should think about it. This kind of donation is not good. But in Nepal and India there’s a tradition to give to anybody who’s begging without thinking about consequences”. Lama Tenzin Sangpo: “Effective charity is something that brings real benefit. For example, we see that someone is begging because he/she doesn’t have a job. Maybe one doesn’t want to work, but it’s possible that circumstances made it for this person not being able to find work. If you just give money, it will be spent fast and won’t bring any real change. If one is addicted to alcohol or drugs, money will only support a destructive habit. You can’t really call it “help”. So instead of giving money, it’s better to help find a job for this person. If you see a children asking for money, it’s more useful to make an effort taking them to school, so that they don’t need to beg”. Lama Tenzin Sangpo: “In buddhism, material aid is just one of the ways you can help. It’s also the easiest. This type of generosity is considered to be a simple practice: no need to meditate, develop Samatha etc. It comes from a mind free from clinging. If we look at the six paramitas, the last two: One-pointed Concentration and Wisdom, are hard to reach. Generosity is the first paramita and easiest among the six. But you should’t take it lightly: generosity supports all other five paramitas. Each paramita builds on the previous one. So, only with a strong basis of Generosity can get to Discipline. With the help of Discipline we reach Patience, after – Diligence. With Diligence we gain One-pointed Concentration, and with Concentration we develop Wisdom. That’s why generosity is so important: it’s the first step towards other paramitas, and you can’t skip it. Two other kinds of generosity are the giving of protection of fear and the giving of Dharma, which is considered to be the highest. Giving Dharma means to explain to others what is a wrong action and its result and what is a right action and its consequence. This way we show a path to liberation from suffering. If one feels hunger, we definitely should offer food, but it won’t free one from the suffering of the mind. We obviously can’t but deny the existence of physical suffering. Nowadays many successful people have lots of worries and fears that are making them unhappy. All these stem from the suffering of the mind. Giving Dharma is exactly the type of generosity that helps to be free from suffering. Lama Tenzin Sangpo: “It’s important to understand that material aid for Dharma is an expression of giving Dharma, which works well when donating for building a buddhist temple or centre. A buddhist temple – is a home for Dharma and meditation. If such places exist, then many people will have an opportunity to learn these things and after help all beings. Meditating and studying Dharma got Buddha Shakyamuni to enlightenment. After, he kept on teaching for 35 years and helped lots of living creatures. A lot of people are suffering and looking for a spiritual place to take refuge. Nowadays predominant conceptions have to do with privacy, so humans tend to treat each other with doubt, as potential intruders. If there’s an open space, then more and more people would come to devote their time to a spiritual practice”. Generosity is like muscle work – the more you practice, the stronger it becomes. You don’t have to be rich to practice it, everybody has something to share. By practicing generosity, we make it become a part of our life, our state of mind. This way we can destroy the egoistic mental state. One beggar asked Buddha why he is so poor. Buddha said it’s because he doesn’t practice generosity. The poor man told him he has to be rich to give, he doesn’t have anything. Buddha said: “You can practice generosity in five different ways, but you’re not doing it. You have a face, you can smile to others. You have eyes, you can look with love and care at others, but you’re not doing it. You have a mouth, you can praise or comfort others. You have a heart, you can open it to others. You have a body, you can do good things for others, but you’re not practicing it. You are rich to the extent you allow yourself to be”. These short lectures about generosity, as one of the most important practice in buddhism, Lama Tenzin Sangpo gave during his visit to Kyiv in July 2018. Now Ukrainian Buddhist community Rangjung Yeshe is building a Buddhist centre Jangchub Choling in Zhytomyr region. It’s a great opportunity to practice generosity. Jangchub Choling is not only a future monastery, it’s a place, where you’ll be able to learn Buddhist philosophy, meditation from a lineage of authentic teachers, participate in retreats, and even have a spiritual practice under a master’s supervision. Now the centre is being built, and Buddhist community Rangjung Yeshe will be grateful for any donation. Your generosity is a practice of one paramita, a right action and an act of giving Dharma.